I recently attended a large, semiannual antiques and vintage items sale about an hour away from home. It was one of those outdoor, rain or shine, events and so of course it rained the entire time I was there. Despite a golf umbrella, raincoat and waterproof hiking boots, I was wet to the skin within a few minutes. 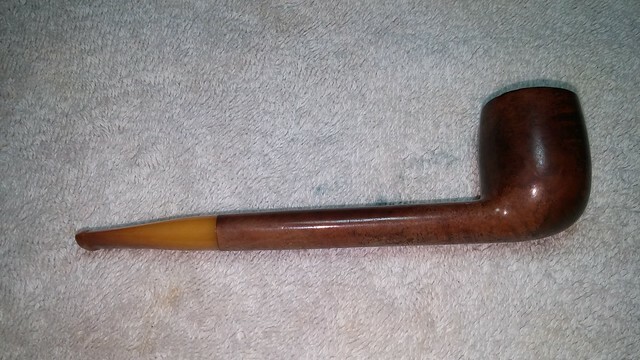 In any other situation I may have contemplated packing it in and getting warm and dry instead of squelching through wet grass, but I was on the hunt for estate pipes, and would not be deterred by something as mundane as bad weather. I love the hunt. It’s part of what makes estate pipes so exciting. You never know when you’ll stumble across something interesting, rare, or historically significant. Valuable would be nice too, but let’s not push it. This turned out to be a good day of hunting. 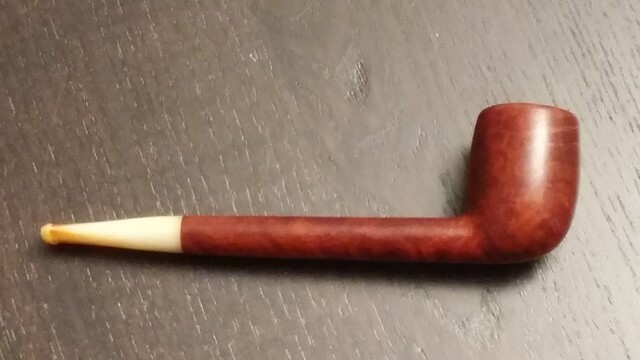 I spent three hours at the fair and came home with eleven estate pipes – some recognized brands, a few I’d only seen in pictures and a few others that were a total mystery but looked like they might clean up well. 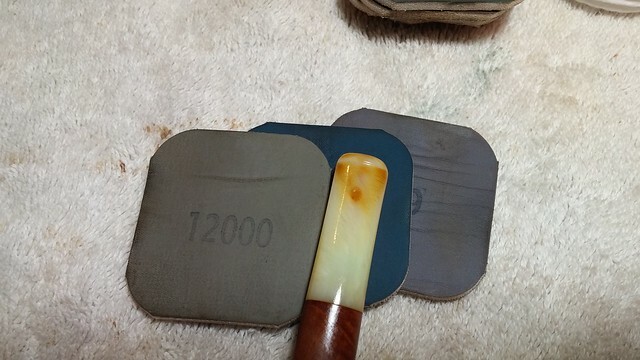 The pipe I chose to begin with from this hunting trip is one from the latter category. 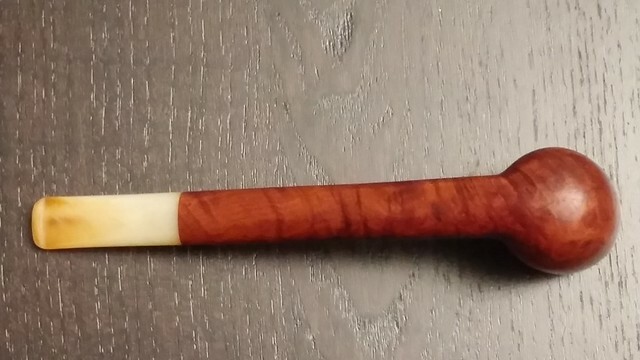 It is a classic Canadian, one of my favourite pipe shapes, with a long oval shank and tapered stem, about 5.75 inches long overall, with a medium sized bowl. The rim was beaten up, but I’d seen worse. 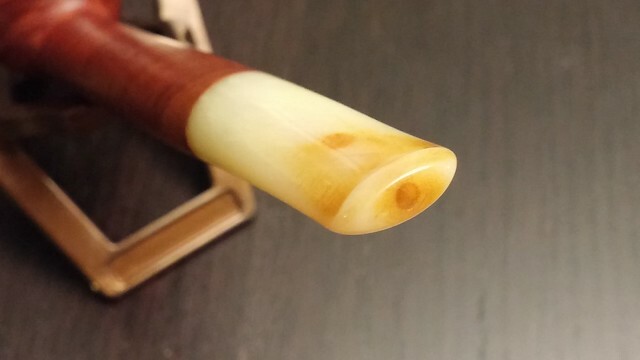 The short stem (made of Bakelite as it turns out) was a butterscotch colour, lighter at the shank and darkening towards the button which featured an orifice type opening. There was a single large tooth dent on top of the stem and some chatter on the bottom. 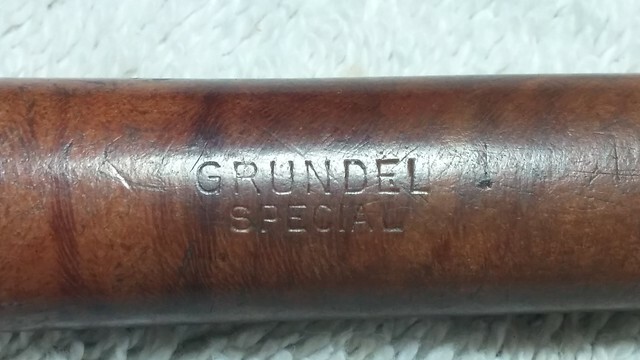 The only markings on the pipe are “Grundel” over “Special” on top of the long shank. 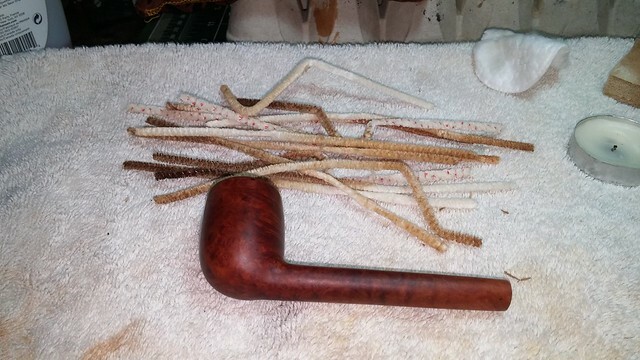 Tracing the history of this pipe took more effort than the restoration, so perhaps I’ll start there. 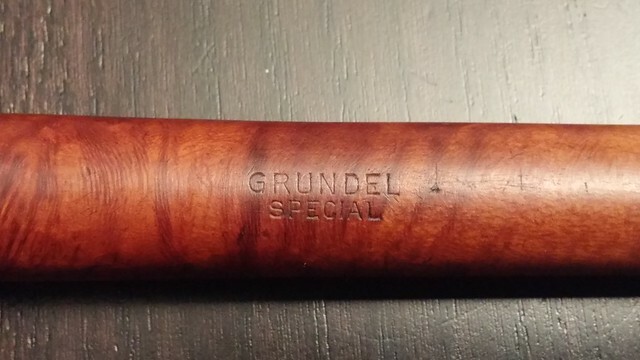 None of the usual pipe reference sites held any mention of the Grundel brand. I was stymied, and then, as so often happens while chasing a pipe’s provenance, Google gave me a clue in the form of a US patent granted in September of 1908. 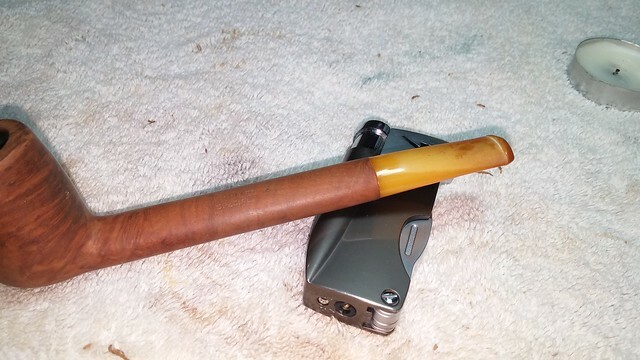 Issued to Emil Grundel, US Patent 898877 described one of the odder attempts at creating a dry-smoking pipe. The details are available here if you’d like to look, but they aren’t vital to our story today so I won’t reproduce them. The important thing was that I now had a name connected to the pipe. A few hours and several cups of coffee later, I had tracked Emil Grundel (1874 – 1948) to San Francisco, California. The 1895 San Francisco City Directory lists our Emil, then 24 years of age, as a meerschaum pipemaker, working for, and sharing an address with, Christian Grundel (1861- 1928), a maker of meerschaum & briar pipes (and presumably Emil’s older brother?). By 1923, Emil Grundel is listed in the San Francisco City Directory as a retailer of “smoker’s articles, pipes & pipe repairing” at a shop located at 2100 Mission St, at the corner of 17th Avenue. Interestingly, it appears that by this time Christian Grundel had closed his own shop and was working for the younger Emil. Emil Grundel disappears from the Directory after 1934, but the 1940 US Census shows him and his wife Maud living in Stanislaus, CA, probably retired, as he would have been 66 years old by then. Grundel’s Pipe Shop reappears in the San Francisco directory in 1945, under the management of Robert Winther and Sydney Greenfield. The shop stayed open until 1951 or 1952 (it does not appear in the 1953 directory), but it lives on in literature – the shop is mentioned by name in Leon Uris’s World War II spy novel “The Angry Hills”, published in 1955. So where does all this leave us regarding the provenance of this Grundel Special Canadian? 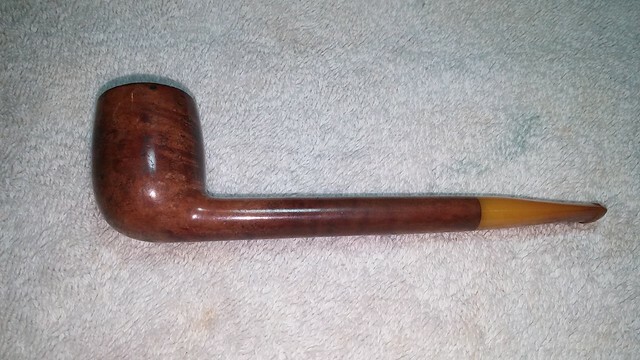 I have no doubt that this pipe came from the Grundels of San Francisco, but when? 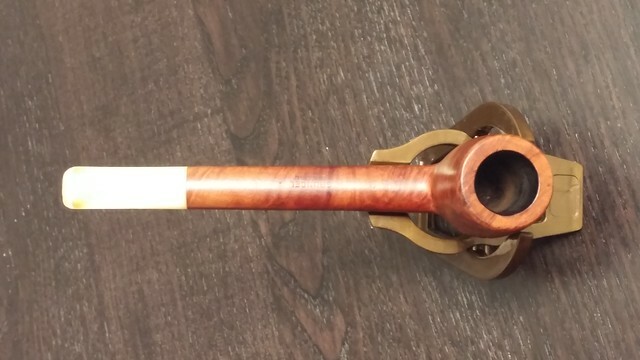 All the evidence points to the mid to late 1920s – the orifice opening was on its way out, replaced by the flared slot; Bakelite had been invented and introduced into the world of pipe-making; and the metal, threaded tenon was making its appearance in more and more American pipes. 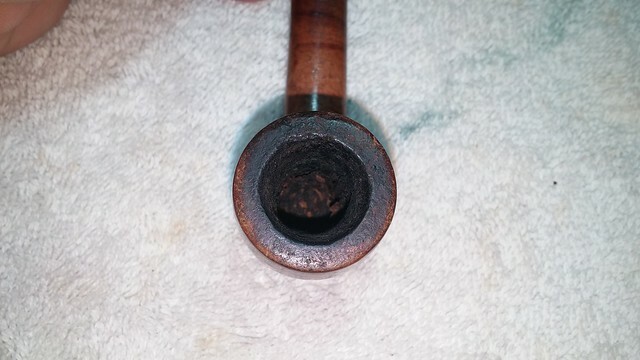 We’ll never know if this pipe was carved by Emil, Christian or a nameless apprentice, but it is a well-made, perfectly drilled piece of pipe history crafted at a time of technological change in the industry. Getting back now to the restoration, there were two major issues to tackle – the rough rim, and the dented stem. 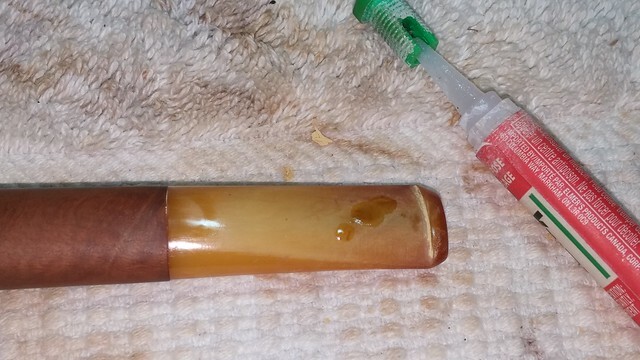 I was intrigued by the stem, so I started there with a few pipe cleaners dipped in alcohol to clear out the airway. At this point, I was unsure of exactly what material the stem was made. 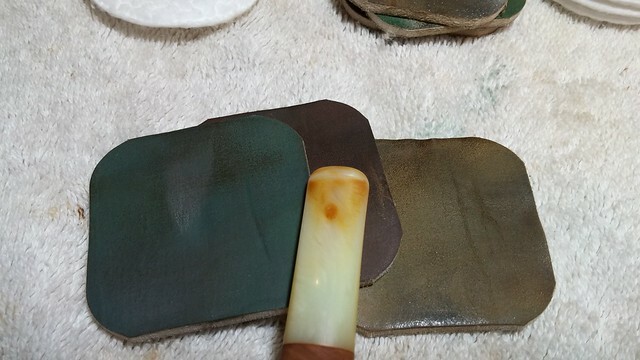 The colouring suggested several possibilities – amber, Amberite, bone, ivory, and Ivorite all came to mind. It wasn’t until after I started cleaning the stem and watched the colour strip off the surface that I realized I needed a consult. 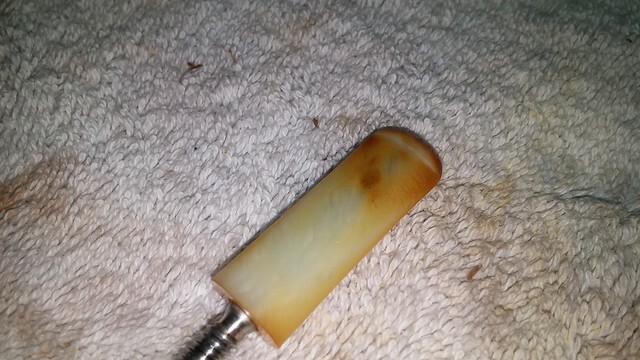 These pictures show the process of drop filling the large tooth dent on top of the stem with clear CA glue and then sanding it flat. The colour change is quite dramatic. There is a subtle, swirling grain pattern in the stem. After a few minutes, Steve rendered his verdict. 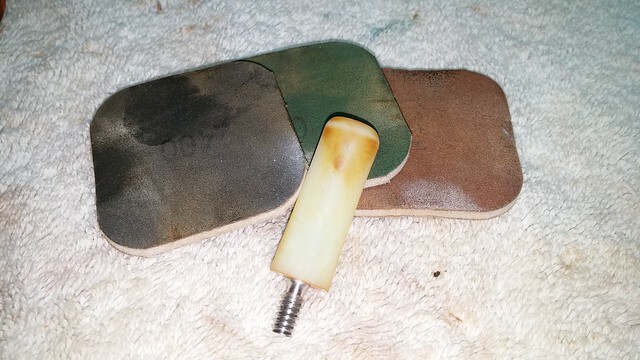 The stem was indeed Bakelite, which, he explained, can be troublesome when repaired. Relieved that I hadn’t completely lost my mind, I carried on with the cleanup by reaming the old cake from the bowl. 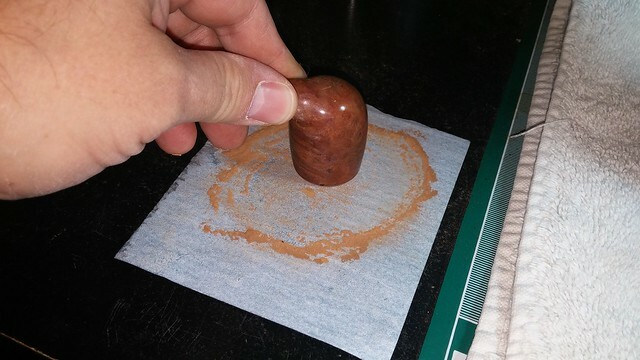 I used 220 grit sandpaper to top the bowl, removing the damaged briar and restoring a flat rim surface. 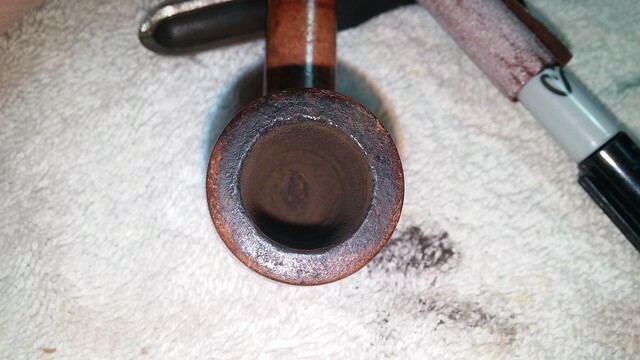 Rather than bulldoze through more briar than absolutely necessary, I sanded a tiny bevel into the outer rim edge to clean up the remnants of the old damage. Then it was back to the pipe cleaners and alcohol to clear out the stummel’s airway. 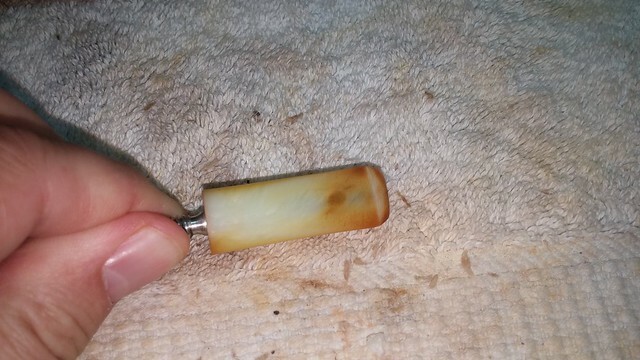 The stem was slightly overturned – a common enough issue with screw-in tenons -so I heated the tenon with a lighter until the glue holding it in the stem softened, then screwed the stem into the shank. The soft glue allowed me to line everything up, and when the glue cooled, the tenon was set fast in its proper position. I used a stain marker to colour match the new rim to the rest of the stummel, and set the new finish with a wipe of mineral oil. 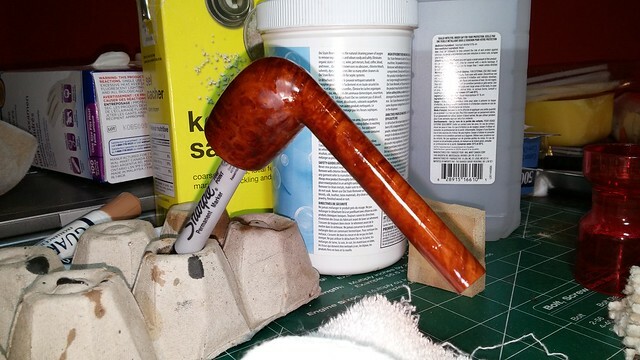 Moving back to the stem, I gave the Bakelite a final polish with micromesh sanding pads. I have to say that, other than the disturbing colour change issue, I found the Bakelite stem very easy to work with. The stem took on a lovely lustre as I worked through the pads. 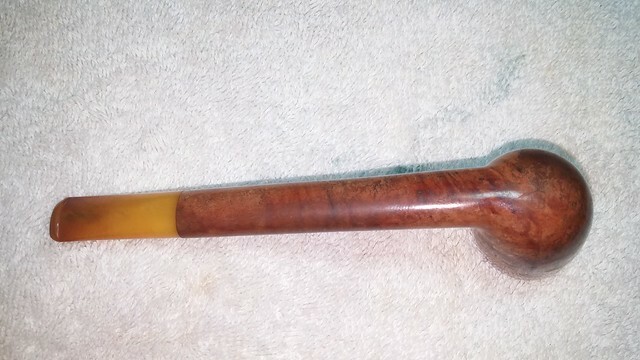 I finished off the work on the pipe with a buff of White Diamond compound on the wheel and a few coats of Carnauba wax. The stummel looks rejuvenated without the rim damage, and the Bakelite stem polished up to a glass-like shine. Altogether, the pipe is once again a fine example of the Canadian shape, and I’ll be pleased to add it to my own collection and rotation. 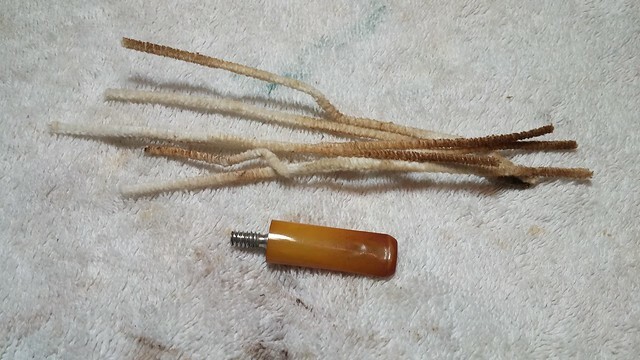 You’ll notice that I did not remove all of the amber colour from the stem. Remember the original picture of the stem? The colour was not uniform from end to end; rather, it began as a dark honey gold that gradually deepened from tenon to button. My theory is that the stem will darken again with time and use. I’ll be sure to update this post after a few dozen bowls. I think I’ll use a softie bit on this one though – that Bakelite is hard on the teeth! Thanks for taking this pipe history mystery trip with me. 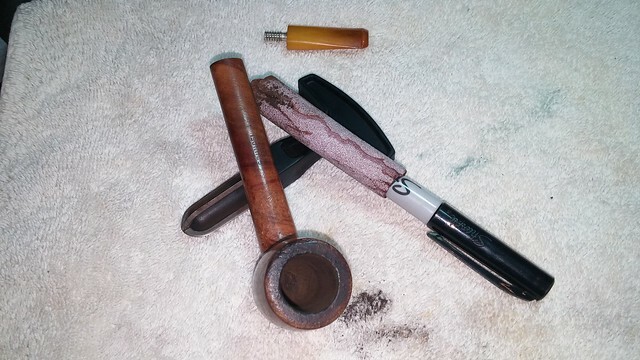 I know a lot of you, like me, really enjoy that aspect of estate pipe collecting. 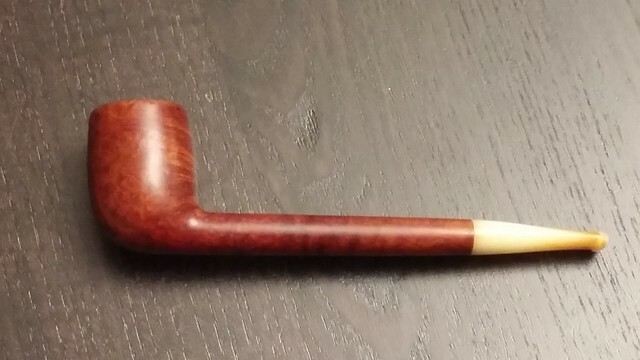 Every pipe has a story, and I learned a lot from this one. I’m happy I could share this story with you. 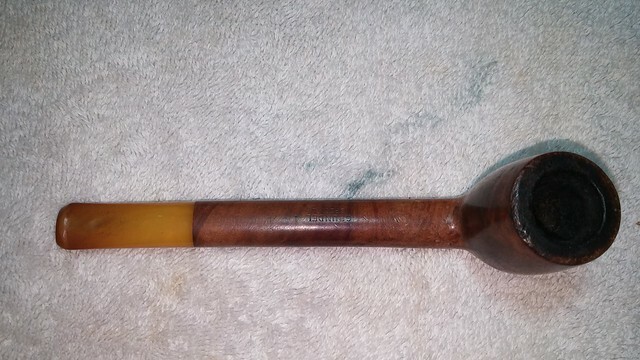 Now that’ a cool pipe! A orifice bit Canadian is something you just don’t see everyday, I’m Jealous of that one! Great detective work on the history of the pipe maker as well. 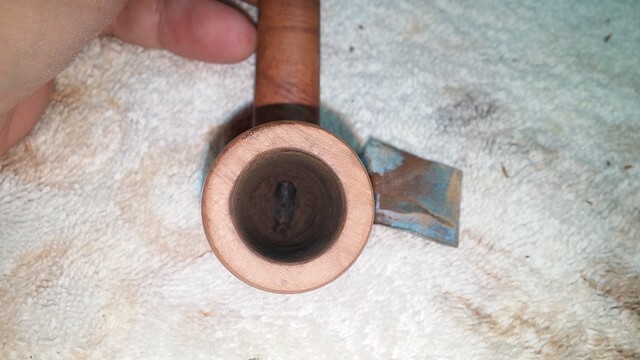 I notice the pipe does not have a metal collar.Does it screw into a metal insert or is it threaded briar? The tenon threads directly into the briar on this one Troy. Thankfully the connection is still solid. No stripped briar as I’ve seen happen. I bet that was a relief, i imagine one stripped out would be a head ache to fix. Great bit of investigative work, Charles. An interesting history and it turns out that the pipe is nice as well. I like the Bakelite stem even with the shading the way it is. I’m sure, as you said, time and use will once again bring back the patina. Thanks, Al. I rather like the red and white look the pipe has now – very Canadian! 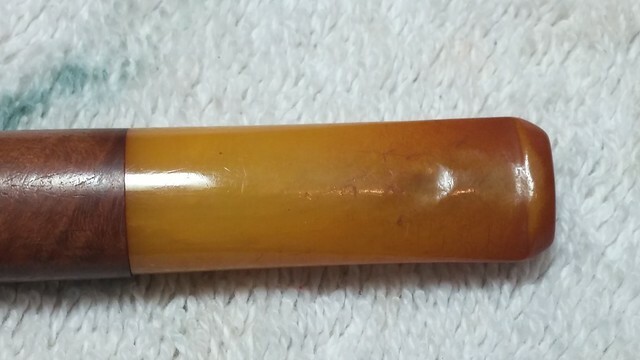 Even without the faux amber colouring, there’s no mistaking this pipe ‘s age. Charles what a fascinating piece of Pipe history. 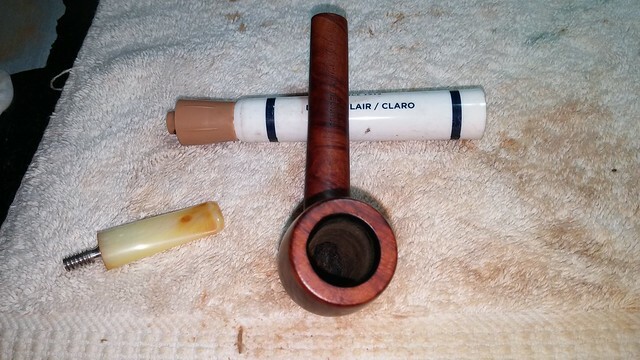 Great detective work and great cleanup on a unique pipe. Well done. This was a fun pipe to research. And thank you, Steve, for being so generous with your time and knowledge. You saved me a lot of grief on that stem! Fantastic investigative work! That must have been a popular shop to have been mentioned in a novel. It will be interesting to see the stem darken again – keep us posted!